It’s the end of spring break here at WVU, and well, I’m getting ready for something New. Fitting, isn’t it, with Easter being tomorrow? I didn’t make any big plans because I knew it was going to be crunch time for me on thesis and end-of-semester things. And I’m sure glad I didn’t! However, I was able to visit a friend in Maryland, where she had a SNOW day- she’s an elementary teacher- and we got to spend all day just hanging out. Well, mostly just hanging out… I was working on my thesis for most of it, but regardless, it was still good to be with her. I’m completely done with my 1200 hours of rotations for my Dietetic Internship- it’s hard to believe that after rotating since last June, I’m FINALLY DONE! I don’t think it’s really sunk in yet. First priority has been my thesis defense presentation, which is scheduled for next Friday. At this point I’m really looking forward to giving it- I’ve been studying home food gardening and kids’ fruit and vegetable intake for the past two years, written a thesis on it, and I’m ready to talk about what I’ve learned. I’ll share more about that with you in a future post. I also have a few paperwork odds and ends to finish up for my internship. I’m working on curriculum development for my new JOB. Which is so exciting. I’m going to be teaching cooking classes to little 2-5 year olds and their parents until the end of September. How cool is that? I have the freedom to put together my own curriculum, so I’ve been researching other programs, and pulling from my past 6 years (!?!) of study in Nutrition and Dietetics to create a fun, interactive program. I plan to share more with you about that experience as it unfolds, but for now I’m just going to share one of my recipes for the class. I gave it a test run tonight, and I’m taking it to an Easter potluck at my church tomorrow. I got the idea (through Pinterest) from this website. 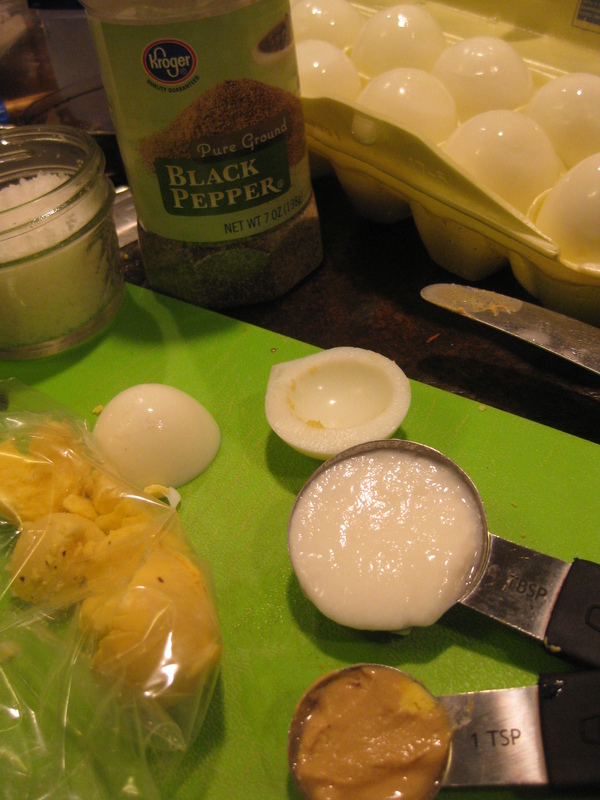 I hard-boiled eggs using the method described in the America’s Test Kitchen cookbook that my roommate has. It’s super simple: put eggs in a large pot. Cover with cold water, place uncovered on high heat until the water comes to a boil. 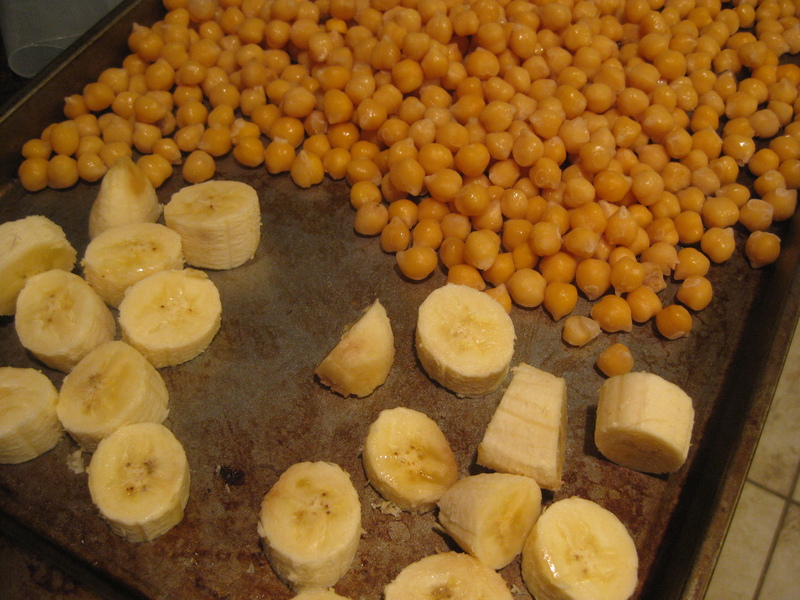 Remove from heat, put the lid on the pot, and set your timer for 10 minutes. Then place eggs in cold water (iced works best), and commence shelling. 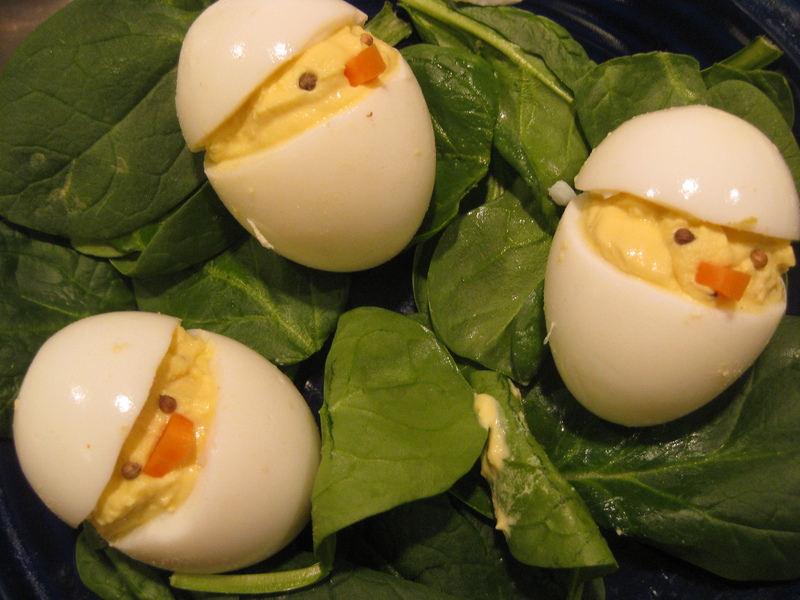 To make these super cute little chicks, lay each egg on it’s side, and cut about 1/3 off the end. I highly recommend cutting on the broader (not pointed) end of the egg, as this is most likely where the yolk will have settled. Then pop out the yolk, and put in a small plastic bag, with a bit of yogurt, a squirt of mustard (I used dijon), and a dash of salt and pepper. Seal the bag, mash with your hands, cut off a corner, and squeeze to fill the crater remaining in the white. Ok, so it looks a bit gross. But trust me, it’s scrumptious. After you’ve filled the egg, cap with the remaining 1/3 of the white, and insert a little carrot triangle for a beak, and something little and black for eyes. I used coriander seeds, because that’s what I had in my kitchen. You could also use whole black peppercorns, or a small piece of black olive- whatever you have that works! Cut 1/3 off the end of egg. 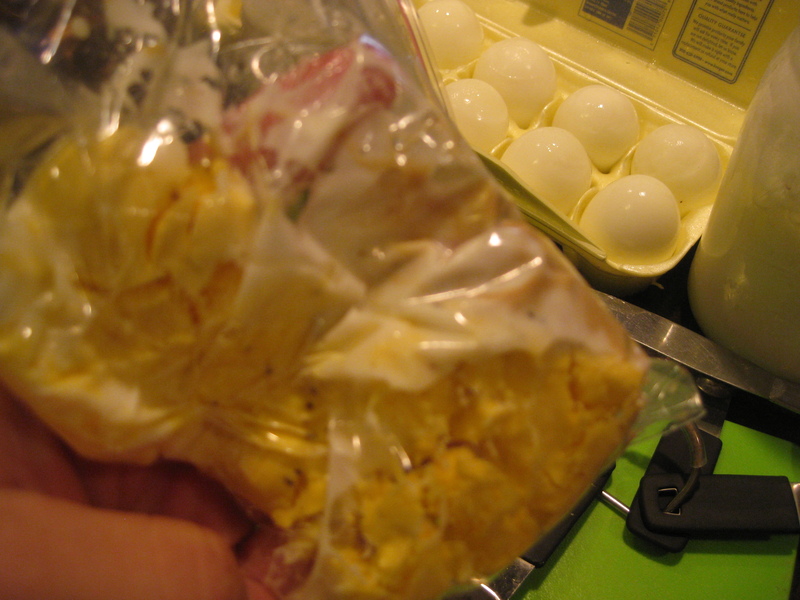 Pop out yolk and place in resealable bag with remaining ingredients. Squeeze out air, and mash ingredients until smooth. Cut a small hole in the corner of the bag and pipe filling into larger piece of the white. Top with remaining white, and give the little chick a nose and eyes. Yogurt is seriously one of my favorite foods. It’s so ridiculously versatile (sweet, savory, and everything in between! 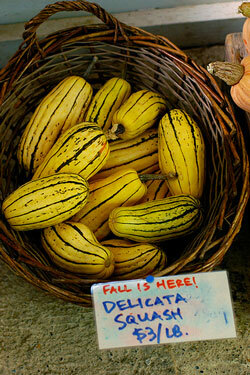 ), has a great texture, and is really great for your digestive system. I make my own, and go through at least a quart a week. In this recipe, using yogurt instead of mayonnaise for the deviled eggs cuts way down on the fat, and you hardly even miss it. Categories: Community Nutrition, Healthy Dishes | Tags: children, cooking, dietetic internship, Easter, eggs, food, nutrition and dietetics, thesis defense | Permalink. I needed a ray of sunshine tonight. Just a bit. It was dreary and drippy and my shoes got wet walking home from my rotation. Please don’t get me wrong- I was thankful for my raincoat, and my umbrella, and my warm home to dry off in. But my spirits needed an extra boost. In addition to exercise, nutrient-dense fruits and veggies are a great way to stave off the winter blues. Every Wednesday night I gather together with a group of friends for dinner, and tonight I was asked to bring a vegetable side dish. 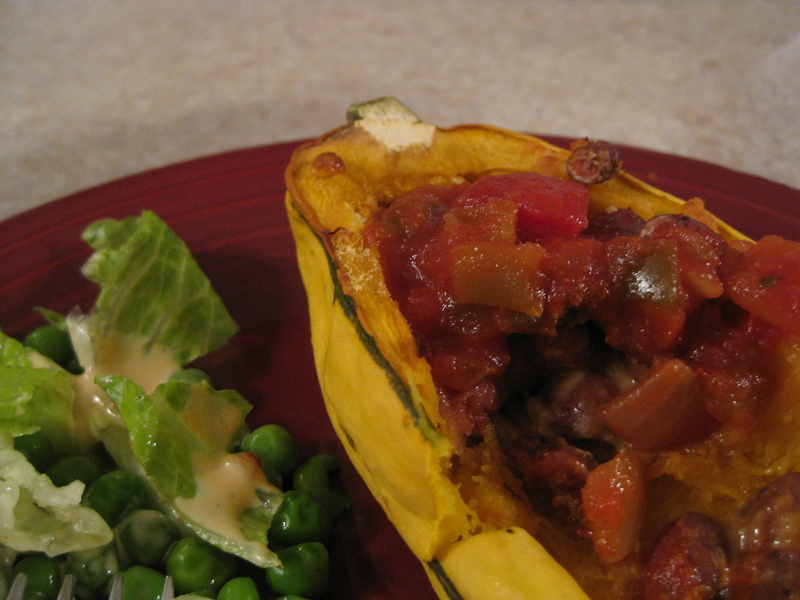 I didn’t want to spend a long time cooking, and I was ready for something fresh and raw. I pulled a handful of carrots out of my mega-bag that I have been chowing down on the past few weeks. I scoured the outsides well with a vegetable scrub brush. 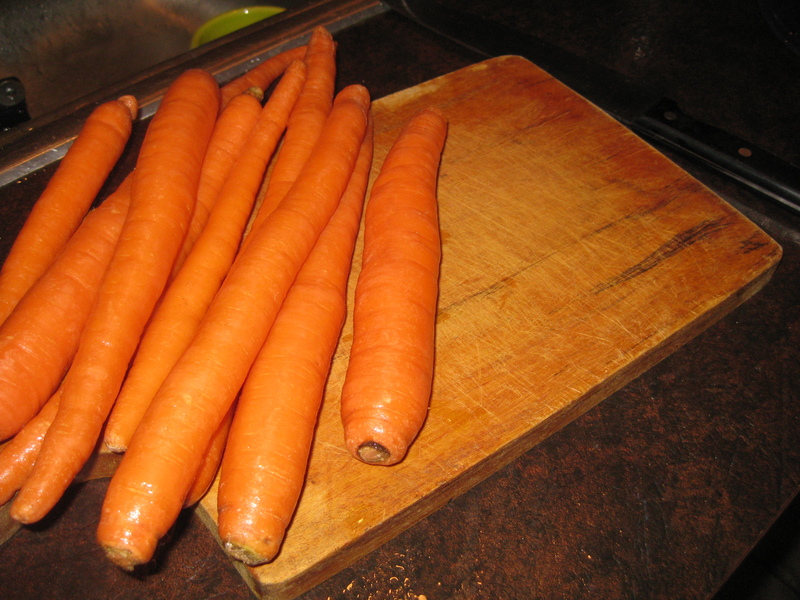 I don’t bother to peel my carrots- I buy organic carrots- because that way I get to keep a bit of the extra fiber and nutrients, and there isn’t as much waste. Speaking of food waste, I just happened across this article about using carrot peels (byproducts of the ready-to-eat vegetable industry: aka baby carrots) to create an antioxidant high dietary fiber powder. Cool! But, I’d rather just buy whole carrots, and eat the entire thing, rather than buy pre-cut ready-to-eat baby carrots that create a lot of waste. 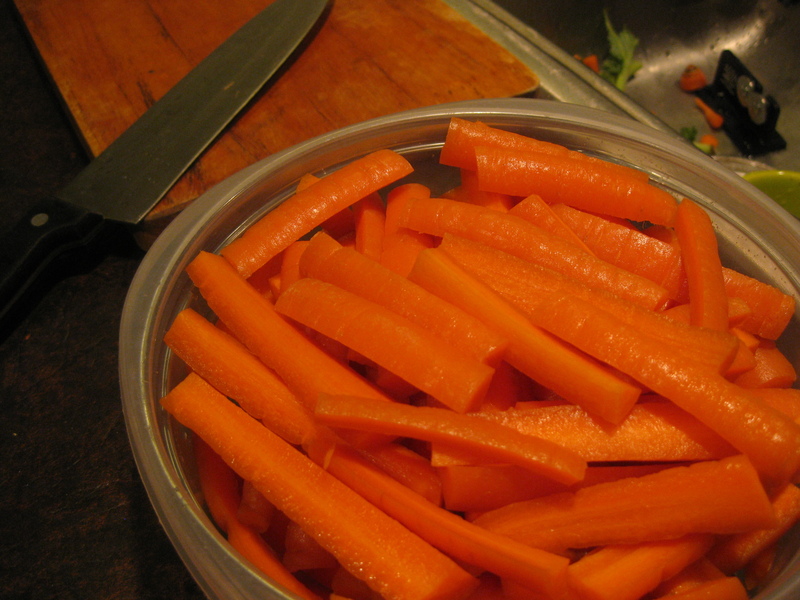 That being said, if you want convenience food, baby carrots are still a MUCH better snack than a bag of chips! I haven’t costed it out, but I am nearly certain that it is cheaper per ounce to purchase whole organic carrots than pre-cut conventionally grown. And considering that I took me only 5 minutes to transform the above pile into a full bowl of short, easy to munch on carrot sticks, this is a worthwhile way to pinch your pennies at the grocery store. 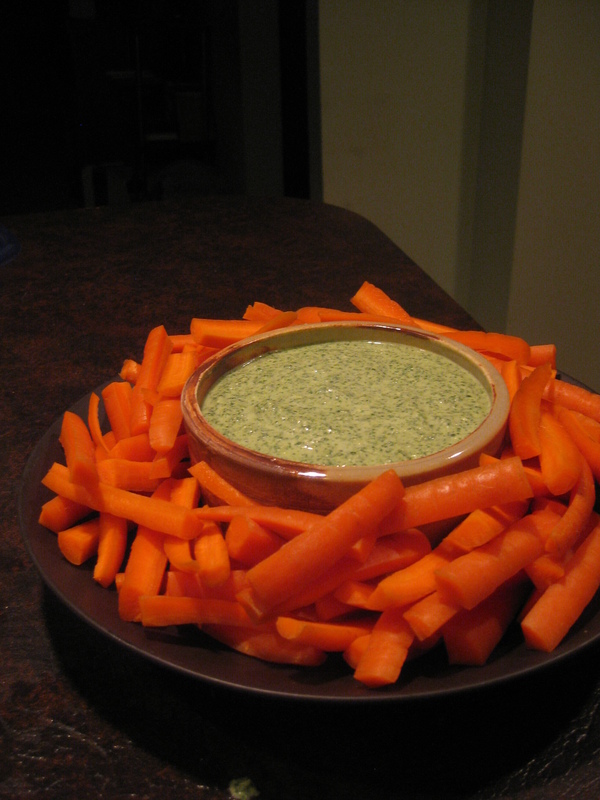 To accompany my little Vitamin-A rich spears, I decided to make Green Surprise Dip. I first made this with my supervisor from Joshua Farm when we were giving a demonstration on fresh veggies to a group of moms at a local pre-school. 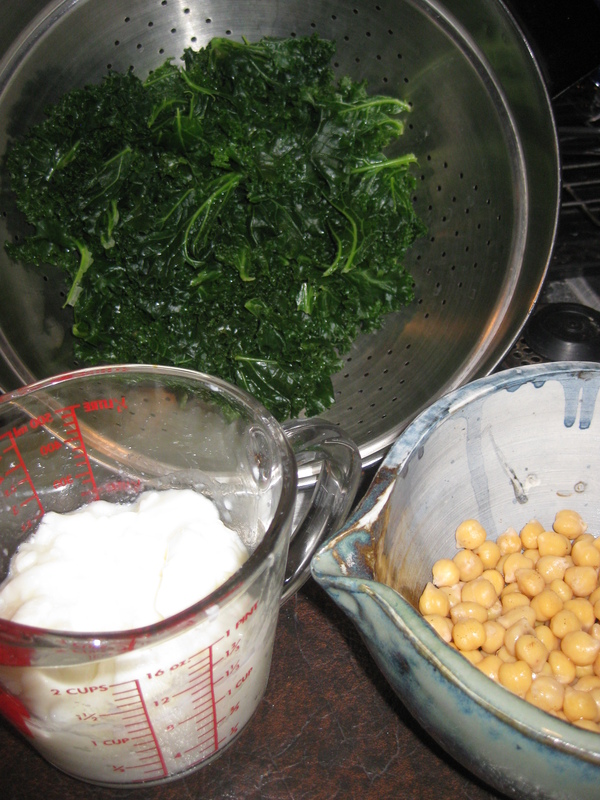 I steamed and drained a handful of kale, and measured out plain yogurt, chickpeas, a bit of mayo, some garlic, onion, lemon juice, and a of salt. 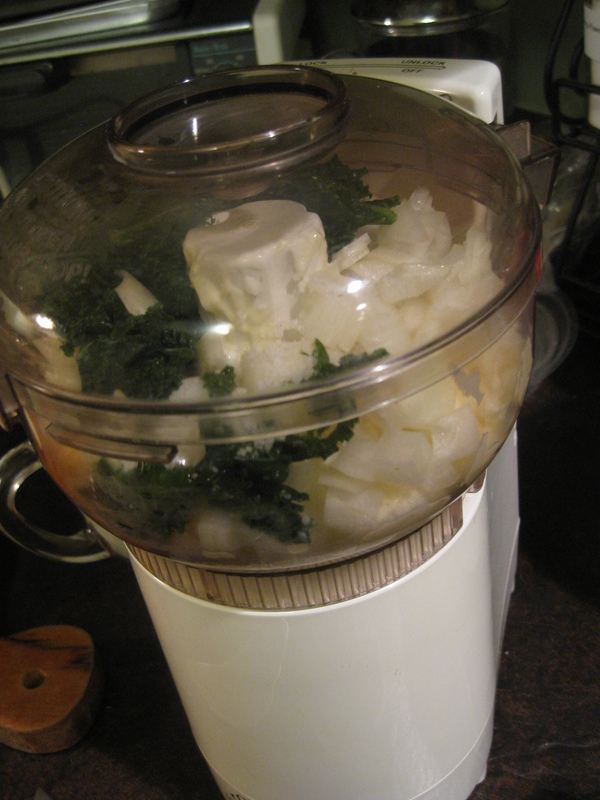 Then I threw them in my handy-dandy food processor, and voila, I had a delicious dip. I modified the recipe slightly from the original. My onions and garlic were really strong (they’ve been stored for a while! 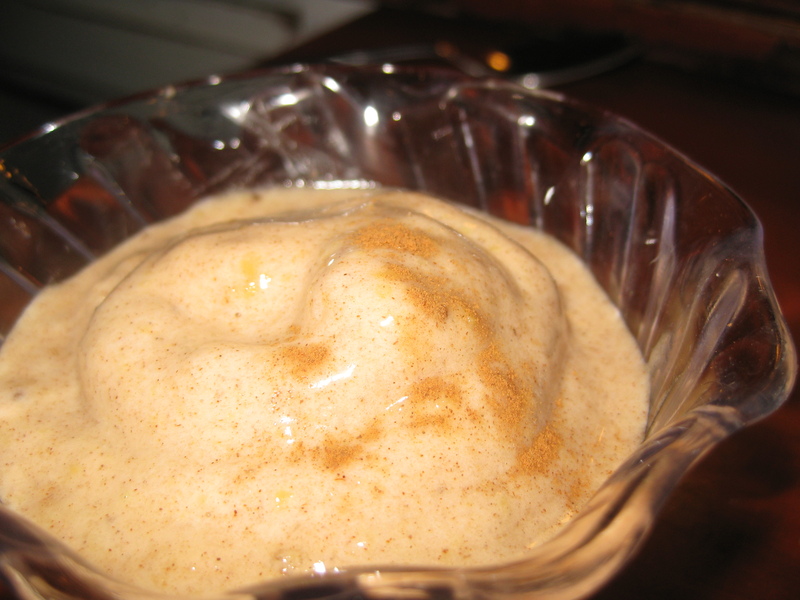 ), and I wanted to keep the concentrated green color so I actually reduced the amount of those three ingredients. The dip didn’t quite get RAVE reviews like an herb veggie dip that I’ve made before, but I really like this one. A bit more salt, and more experimentation with spices would perk it up a bit, but I was on a time crunch. It only took 15 minutes from when I started cutting the carrots to when I had this dish assembled. But then I had to clean up- and that was another 12 minutes. With a few tunes playing and some dancing around my kitchen, it was a pleasure. Categories: Healthy Dishes, Wellness | Tags: baby carrots, food, fruits and veggies, health, organic carrots, recipe, snacks, vegetarian | Permalink. Things are a bit steamy in the tower- I believe that has something to do with the photosynthesis going on. One of my biologist friends might be able to correct me on that, though! The sprouts are just about to the top of their trays, so I think they will be placed in the fridge tonight. I continue to harvest a little bit at a time. Last night a little bit of each sprouts were stuffed inside a pita bread with tuna salad. I make my tuna salad with tuna packed in water, chopped celery, plain (homemade) nonfat yogurt, and simple seasonings like celery seed, paprika, pepper, garlic, and minute sprinkle of salt. It’s a great high-protein meal. The mung beans have a tendency to get pretty long, stringy, and a bit tough. This might be because as I am taking out sprouts, the remaining ones have more room to grow. I don’t particularly like the stringy texture, so sometimes I’ll chop them before adding them to dishes. Last week I made some mung bean “pancakes”- pretty much just an omelet. I haven’t quite come up with a plan for these yet. Does anyone care to share their favorite ways to eat sprouts? 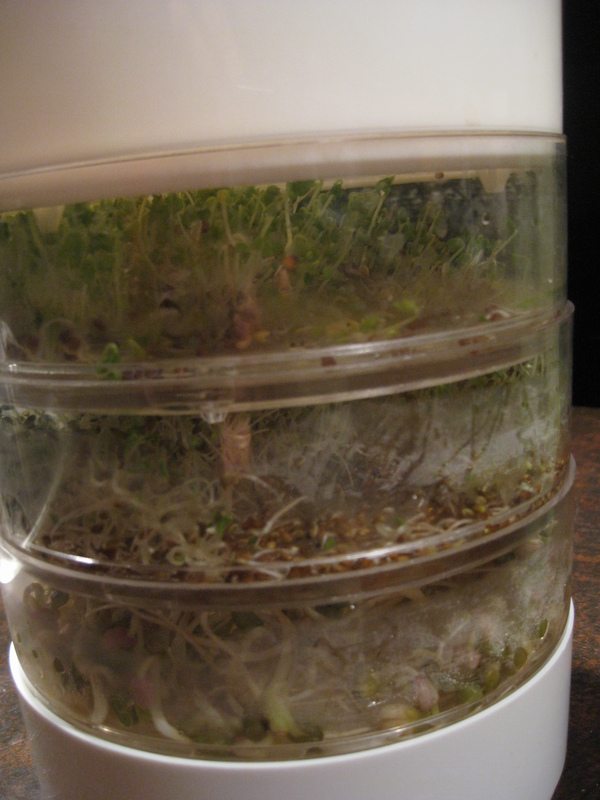 Categories: Healthy Dishes | Tags: celery seed, chopped celery, food, health, nonfat yogurt, nutrition, sprouts | Permalink.